This course has made me do some serious thinking in regards to technology use in the classroom, as well as the impacts it has on childhood and society. I’ve learned through our debates how important of a role both teachers and parents have in determining the effectiveness of technology and social media. I used to worry too much about using tech in the classroom “just because” I thought I should be. I’ve started using it much more purposefully, to enhance learning not to replace pen and paper. I made fun of most social media. It was a waste of time and was nothing but negative for our ‘kids’. My students and daughter will use it regardless so I MUST learn to embrace it and at least learn how to use it. I recently made a SnapChat and Instagram account. The better I understand these common apps our kids use the more I can help them use them responsibly. Throughout this course I kept thinking of my daughter. How can I ensure she uses technology in a positive way in the future? How can I protect her? The answer I kept coming to was that I must be a positive role model. This is what led me to my summary of learning. As I was making strides and trying new things throughout this course all I kept thinking of was the huge stages she has already conquered in her short life. This is why I chose to use her as inspiration for my final video. I hope you enjoy! Does technology simply mirror human prejudice? This weeks debate had me thinking how horrible humankind truly is, especially if the technology we use often has been proven to have prejudicial views already seen daily in our society. Amy did a great job of pulling the main points from the agree & disagree side of this weeks debate topic “Technology is a force for equity in society” in her blog this week! The disagree team certainly had me questioning how great technology truly is. They provided many statistics and facts about the frequency of racism, sexism, etc., that many programs show, as well as the oppression that occurs even more so because of the financial divide that occurs from technology. This article provided by the disagree group discusses how it isn’t necessarily the technology that is racist or biased, rather it is learned from human behaviour. I completely agree with this article because humans are the ones building the technology, so it would make sense that it will be flawed and have some of the negative attributes we see in humans. Now, this article definitely goes over my head because I do not understand how algorithms work and how an algorithm can have the ability to be fixed such to not show prejudice. I do agree though that this is something that can be worked on with time. This guardian article focused exclusively on the sexism that occurs within technology, in that voices are frequently female, and also can be quite dangerous as location is becoming nearly impossible to keep secret with the different applications in which are used. Again, negative attributes of humans which are mirrored into the programs we build. These books are great cautionary tales, similarly to Black Mirror, of the dramatic and sometimes dangerous impacts that technology can have. So I know I have typically fallen on the side of “anti” technology in our debates so far, and I would say this week I ended up the same way. The agree group shared this great article which listed various amazing positive uses of technology, including Open Educational Resources which can be downloaded, edited, and shared to support teaching and learning. These types of resources can and should be used in rural Saskatchewan to help support learning. So, yes there are definitely great uses for technology. There were many fantastic blogs this week, and it was a bit surprising to me how many people were wavering between sides in the debate. Nicole does a wonderful job of comparing fair and equal in her post this week, and in no surprise she shows how imperative relationship building and the teacher’s role is in ensuring that technology is used in a way to help build equity. This whole class I have had the feelings, and Shelby nailed the same ones, of I totally see the pros to technology and the positive impacts it can make, BUT I DON’T THINK WE ARE THERE YET! A) Children/Students use technology responsibly, especially privacy and location settings. B) Technology is used to enhance learning further not just to replace what pen/paper can do. C) We model the positive impacts which can be made from technology. Don’t avoid it, rather use it alongside them. I have thoroughly enjoyed this course, and the major strides I have made in my personal social media use! There were some major learning curves along the way and thanks to everyone for following my progress! This weeks debate was definitely the hardest one for me to choose a side on. I went into the debate agreeing with the statement that “Social media is ruining childhood”. I must say, I am definitely torn and I truly see the positive aspects to Social Media (SM), however because parenting and educating has not caught up in regards to informing our youth, in my opinion, I do still agree that SM is ruining childhood. Now, let me start off with saying that I do not think that this applies to every single kid and that every single parent and teacher is the worst, blah blah blah. I don’t believe that at all. I simply believe that we are making great strides to navigating how to inform and educate our students and children on digital citizenship, however we aren’t quite there yet. Lori makes great points in her blog this week, especially in regards to how she has luckily been able to step in before her son participated in some very dangerous acts circulating online (THANK GOODNESS!). I believe if I had taken this course even a year ago, before having my daughter, I might have some different opinions about this topic. I also believe if I were not a teacher I might have different opinions as well. So, I definitely do see the positive aspects to SM use. The disagree group shared this article from The New York Times, which shares aspects that are without a doubt positive sides to SM use. Such as how much it allows for people to discuss important topics, such as those that were previously taboo or “not normal” which are now openly discussed and give students a safe place to feel apart of. For example, different races, cultures, sexual orientations. SM also helps youth build their own perception of the world and beliefs. This article, also provided from the disagree group shows the positives of allowing students the power to broadcast to the world, offers support for those who feel like an “other”, and provides a powerful example of how an online forum allowed for peers to talk someone down from committing suicide. What I disagree with in this article is that SM strengthens friendships. I have this argument often with people who are like “Why don’t you have SnapChat or Instagram?” “How do you know what your friends have been up to?” (FYI, I CALL THEM! ), because seeing someone’s “story”, on Instagram or SnapChat, may keep you in the know of what that person is doing it doesn’t truly strengthen the friendship. It just informs you. A controversial example, which is currently very popular in high schools is the Netflix series 13 Reasons Why. A book and now series that are intended to start the conversations of many extremely important topics. It is told that it cam glamorize suicide. Parents refuse to let kids watch the show and schools ban the book. How does this help by hiding it? I understand that there are very graphic scenes and tough topics discussed in this series, but it is an attempt to bring those to the forefront. The cast and production have many great resources delving deeper into why they want to open the discussion of these topics, this video is only 1 of many! Yes, some of you may be feeling like this (^) thus far, but here me out. The agree group had some great arguments, and one in which I definitely agree with is that social media does not help build relationships, in fact it is detrimental to students building key skills for relationship building. Emotional and social development is still forming in youth and SM impacts it greatly. Addiction to and sleep deprivation. Many parents cannot keep up with the ever-changing apps and social media networks. Now, I believe everyone has done something stupid at some point in their life. However, a digital footprint and risks of privacy should be addressed and need to be taught and discussed. Discuss with families or students the need for a family online-use plan that involves regular family meetings to discuss online topics and checks of privacy settings and online profiles for inappropriate posts. The emphasis should be on citizenship and healthy behavior and not disciplinary action. Until there is constant and consistent balance of use then I have to say that SM ruins childhood by exposing kids to inappropriate content much too early. Once all children are using appropriate media at appropriate stages in their life, all the while responsibly then I will 100% see the positive side to SM use; enhancing creativity, growth of ideas through creation of blogs/vlogs/podcasts/etc., expansion of ones interest through online connections, fostering one’s individual identity and unique social skills, and opportunities for community engagement through raising money for charity and volunteering for local events, including political and philanthropic events. I love this topic because there are so many great opinions and I believe they change daily/weekly/yearly. I truly hope we can get to point where we can use SM solely (mostly) for the positive sides that it does have! I cannot wait to hear what everyone has to say! Bring on the discussions and open the dialogue to help our children and students! Schools must teach students HOW TO ‘Google’! Do I Agree that we shouldn’t be teaching students information that can be googled? During Monday’s debate, as well as the readings provided, the agree team made me waiver in opinion. Teaching them skills such as choice would really help them in the longer run. Two important questions that come to mind are “Do we disregard curriculum altogether then? “, as well as “What would a classroom look like if so?”. The TedTalk provided by the agree group goes on to say that the value of knowledge is dropping because it can expire, and that internet accessibility provides us immediate access to knowledge therefore we should be teaching creativity and how to apply new information instead of what we currently are teaching. There are a few problems I have with this video. I feel like I have heard that “education needs to change” for years, in fact this video is already 4 years old. So when does it change? I think we don’t know how to do this, or, perhaps more accurately, we do but don’t want to or can’t afford to do so. We all know the facts that he states. Teach to the different needs of students, learn from our mistakes as educators and transform the system. But again, when will this happen? “The Objective of Education is Learning, not Teaching” article states the obvious that most if not all of us learn better when we teach others. I specifically love the comment “at a very early stage…how to learn is largely their responsibility”, because very often the parents or teachers are blamed for students who leg behind. I personally believe that we need to hold our students and children more accountable and for them to show that intrinsic motivation to do their best, not just because their parents say to or for an award. I Disagree with this weeks topic. A second reason that I believe the entire class agrees upon is that we need to be teaching students critical thinking skills. But what does that mean? Honestly, I might struggle to answer that and so would my students. 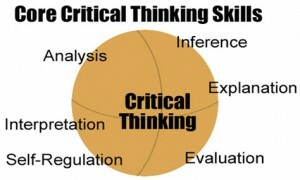 This visual from the article “Using Technology to Develop Students’ Critical Thinking Skills” finally tells us exactly what critical thinking really is. All of these skills are needed to navigate the internet and the copious amounts of real and fake information out there. This article also provides great examples for the types of skills you want the students to learn or show and what types of questions to be asking. For example, if you want a student to be able to critique something you should be asking them “What is the best…and why?”. Lastly, I am very ‘pro’ that memorization is important and that there are many areas where it is simply needed, and opinions or personal input are not as important. The article “Why memorising facts can be a keystone to learning”, talks about the skills we use every single day, such as eating, walking, driving, that are memorized and stored for easy retrieval. Memorization, such as any other type of learning, should not be the sole type of learning taking place. It is using different techniques together and using students how to build on the skills and knowledge learned that will help them to be successful in the future. ^Not the way we want our students to be using their memory…but you get the idea! All in all, I must say that the moral of this story is we must be teaching our students better skills for researching online. Many students will pursue post-secondary schooling of some sort, thus need to learn how to properly search for information and sift through what is true and factual/proven and what is not, or is really just an opinion. As mentioned in the week 1 debate, the students will use these search engines at some point, thus we should be showing them how to use them properly. An argument our group made in defending WHY technology does enhance learning was that it helps move from teacher-centred learning to student-centred. This Tedx Talk, by Joe Ruhl, discusses the essential 21st century skills we must be instilling in our classroom and students: choice, collaboration, communication, critical thinking, and creativity! Ruhl is definitely an experienced teacher (37 years! ), thus has had the time and knowledge to build activities that are 100% there to enhance the students learning. He shows how technology isn’t necessarily always computer based, although can include it as well. A key take-away, which I agree with wholeheartedly is to give students the option of how to present their learning. For a student that might consist of pencil & paper or a computer program…both options are in fact technologies. At our Monday night debate one thing I believe we all agreed on was that it all depended on the teacher. We cannot forget how important relationships are with students, because without them there can rarely be meaningful learning, and solid relationships allows the chance for growth both academically and personally. We MUST teach our students with the help of their families to instil positive digital citizens! It is funny how often students say to me “you’re a young teacher how don’t you know” in regards to technology. I have never been huge into learning a lot about technology or about using it in the classroom. When there are issues with computers or devices in the classroom I typically text one of my go to coworkers and they tell me how to fix it (embarrassing I know). In the past I have used Remind101 with students, and at Miller we have a Phys. Ed. Instagram account to share updates on what we have been up to with students and parents. Other than that I really haven’t incorporated technology in other ways. I have attempted having a Weebly, although found it frustrating at times. All in all I have essentially given up in that department. I think the biggest reason I have given up at times is because I find it seems to change so quickly. Even today when setting up my blog, the YouTube intro video doesn’t look the same as WordPress anymore. Thus, by time I get the hang of something, it typically updates and changes and then I feel like I am back at square one. My goal for the end of this course is to feel more competent in using at least one different form of technology and will realistically use it moving forward. I recently made a google account for the first time, and our FlipGrid for this class was my first video I have ever uploaded of myself….so big steps have been taken already! I am a bit overwhelmed at the prospect of so many things to learn, but at the same time I am excited to step out of my comfort zone and try to commit to incorporating technology into my life, especially my professional life.